At its best, sport brings people together in friendly, respectful competition. It can be part of the healing process that makes age-old enemies into neighbours and maybe even friends. On Christmas Eve, 1914, in a spontaneous act of humanity, German and British troops fighting on the Western Front ceased hostilities, walked into the barbed-wired no man’s land separating the two sides and spent part of a day together. They found common ground in Christmas songs, cigarettes and—most famously—football. Varying accounts describe everything from an enormous pick-up game in which several hundred soldiers took part and where military helmets were laid out as goalposts, to an organised match between the 133rd Royal Saxon Regiment and Scottish troops, for which a reverend acted as referee. However it really played out, that football passed between the trenches became a strikingly bright anecdote in one of the most violent periods of modern history. But that remarkable ‘Christmas Truce’ match was not the only time of conflict in which people turned to football and its near-universal appeal. The game has often taken on a political character, aiding efforts to reach detente between warring sides, or even flaring tensions in bitter rivalries. For the past five decades Colombia has been immersed in a bloody civil war involving the government, the FARC (Fuerzas Armadas Revolucionarias de Colombia, the Revolutionary Armed Forces of Colombia People’s Army) and crime syndicates, and while the nation’s social fabric has been ripped apart by the violence in many ways, soccer has always been much more than the national sport. In fact, it’s one of the very few things over which all Colombians are willing to put aside their political, cultural, social, and economic differences and be on the same side, wearing the same yellow shirt, for 90 minutes. 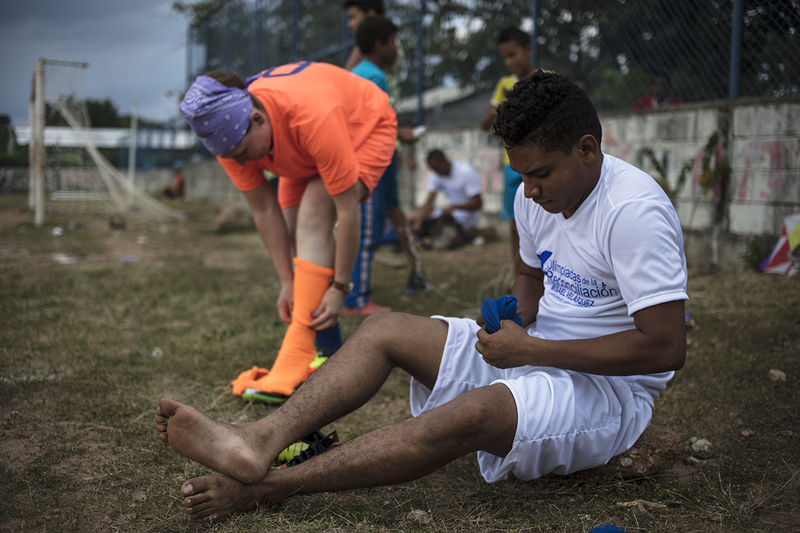 Football is somehow fundamentally tied in with the Colombian identity, and just as it has often been a source of joy that spans generations, it has also been symbolically present throughout the country’s violent history. Andres Escobar, a young football star, was assassinated after scoring an own goal that led to the elimination of the national team from the 1994 World Cup, a testament to the limitless cruelty of the drug cartel gangsters. Three years later, during one of the most gruesome episodes of the Colombian civil war, right-wing paramilitaries infamously terrorised a village on the Pacific coast by playing football with the severed head of Marino López, a peasant who had been accused of aiding the guerrillas. Some say that this practice was fairly common in the early 2000s. In 2016, however, everything is different. 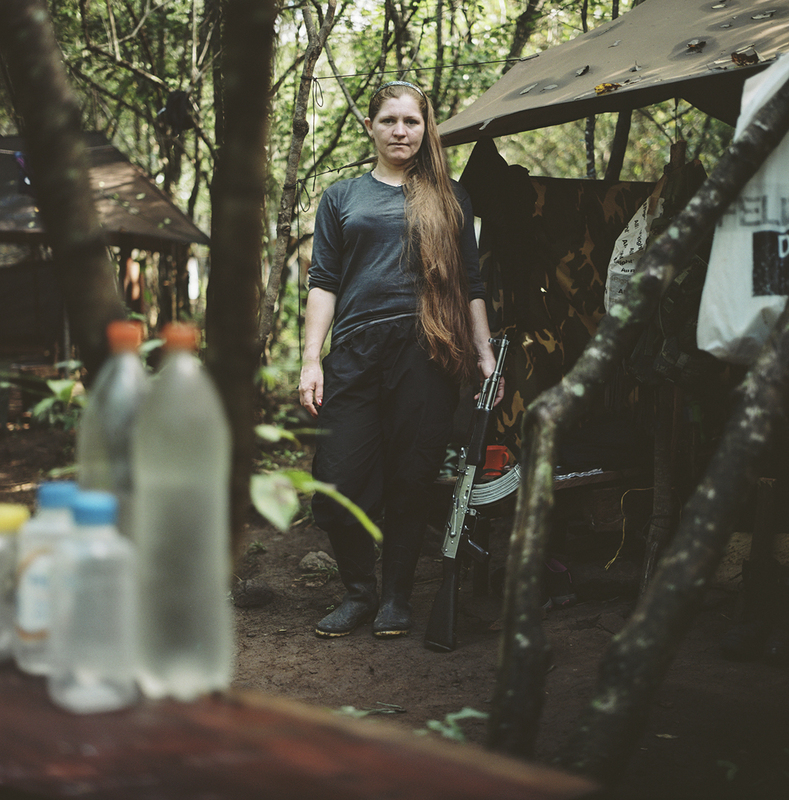 At 4:30 AM, in complete darkness, in a remote mountainous region in the north of Colombia near the border with Venezuela, fighters from the Caribe Bloc of the FARC emerge from their jungle hideouts into a clearing and start falling into formation facing one of the group’s commanders. Instructions for the day are given, and guard and kitchen duties assigned, as the first rays of daylight shine upon the steel receivers of the rebel rifles, US-made M16s and old Soviet AK-47s, for the most part. Then the formation breaks. 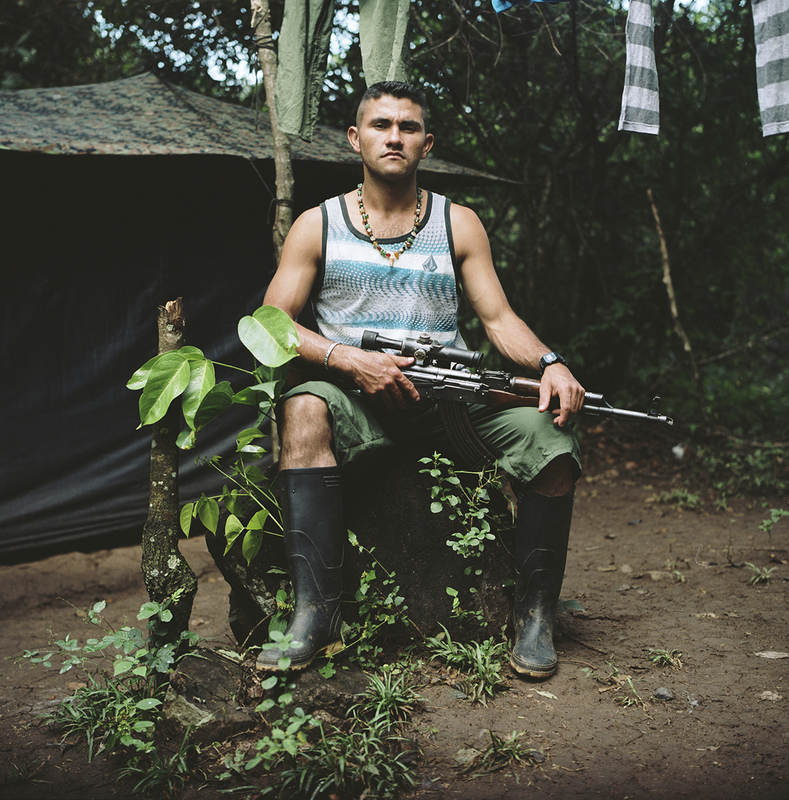 Wartime protocol is still followed by all rebel units across the country, but life changed radically for the guerrillas the moment Colombian president Juan Manuel Santos and the FARC secretariat signed a definitive bilateral ceasefire agreement last June. Throughout an arduous four-year-long peace process held in Havana, Cuba, the number of combats and bombardments dropped dramatically, and the guerrillas began to prepare for their transition to civil life, away from the rigorous military code that shaped the world’s oldest revolutionary insurgency and many of the guerrillas’ lives for the past 50 years. Later in the morning the sun shines bright over a rudimentary mountainside football field built by the rebels near the campsite (an unthinkable sight during times of war, only a few months ago). The goalposts are wooden, and the pitch is sharply slanted, but the bright-red clay soil has an elegant look, reminiscent of the tennis courts at Roland Garros. A group of guerrillas marches onto the pitch and a tattered bright-orange ball begins to roll. According to a young combatant whose nom de guerre is Jaime, since the peace agreement was ratified by Congress, all of the FARC’s units have begun regrouping in areas like this one around Colombia to begin the demobilisation process. 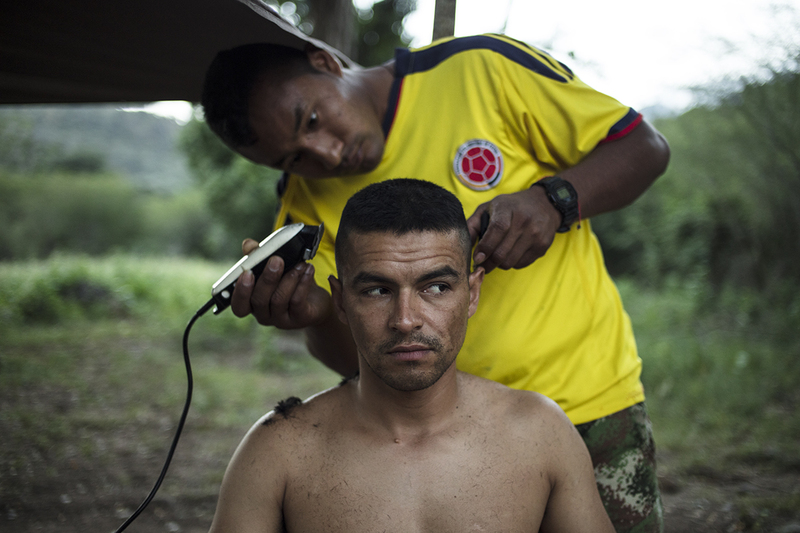 These demobilisation zones were designated in conjunction with the government and the United Nations’ mission to Colombia, and they are gradually becoming neutral grounds, where it is hoped that long-held blood feuds will dissipate little by little. He’s referring to the grand finale of an Olympics organised by the mayor’s office of the municipality of Fonseca (the jurisdiction nearest to the campsite) to promote the peace process and provide spaces for reconciliation between the guerrillas, the armed forces, and the population. 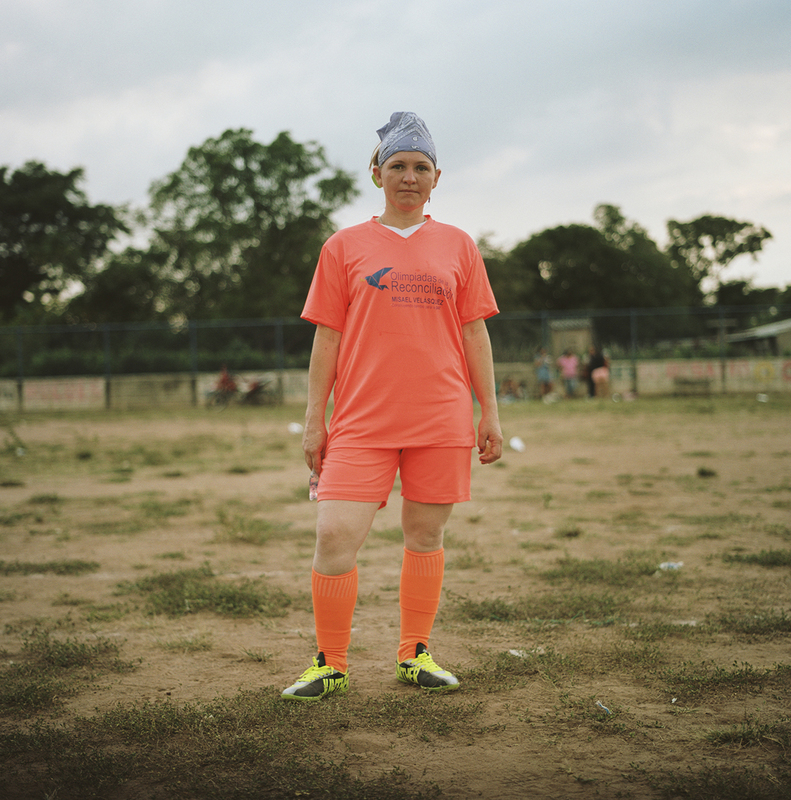 Volleyball, chess and athletics tournaments in which both guerrillas and civilians took part were held in the adjacent village of Conejo, but by far the most awaited event of the festivities, as always, is the closing football match in the town’s main field. The tourney was branded El Partido de la Reconciliación (the Reconciliation Match), and even the mayor announced he would play. The day of the game arrives. People walk the dusty, unpaved streets of Conejo, and gather around the football field. Dozens of kids kick tattered balls around, and the players of the highly anticipated game begin to arrive. A number of unarmed guerrillas in civilian clothes chat with the villagers and take pictures with their mobile phones. The mayor, Misael Velázquez, makes an entrance surrounded by his staff, and several police officers in uniform follow. Then the UN delegates arrive, wearing their distinctive sky-blue caps and vests. Jerseys are distributed and the participant delegations merge before being divided into two teams, a white team called Mayor’s Office and an electric-orange one called Integration for Peace. The players march onto the pitch, and amidst the bright, tacky uniforms, with the exception of a few recognisable faces, it becomes very hard to tell who is who. From the stands, a local veteran commentator introduces the event through a rusty mic wired to a huge and very loud speaker while the referee tosses a coin up in the air. Integration for Peace wins the kick-off. The game starts without much action; only a handful of players have considerable skills, and the terrain is about as smooth and even as the surface of the moon. The crowd watches attentively, however, and there’s a collective amazement at this monumental moment: people who were, quite literally, trying to kill each other only a few months ago are now kicking passes, however lousy, to one another, laughing from the bench, and high-fiving over goals. 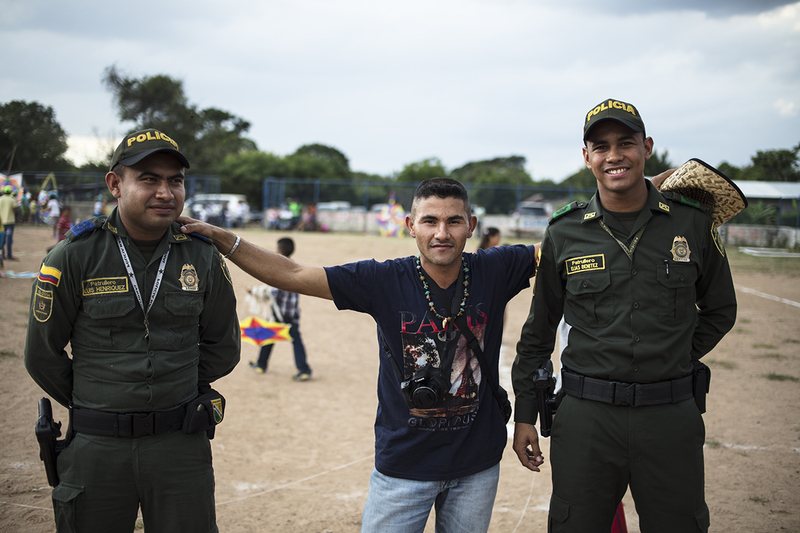 One of those spectators watching intently is police chief Fabián Pedraza, a seasoned officer who has undertaken many tasks in the force, including fighting in the counter-insurgency units of the Colombian police, directly targeting the guerrillas. He now commands the police in this region. Pedraza is not very jovial, but seems receptive. ‘This is a good thing,’ he says, referring to the football game. ‘It remains a special occasion because we’ve never seen anything like it before.’ His tone verges on the apathetic, but his presence here alone is significant. Given the long record of failed peace talks, repression, and political genocide in this country, the support of battle-scarred, mid-ranking members of the armed forces like Pedraza is crucial to the sustainability of the whole peace process. The white team scores first, and people celebrate. Asked why he’s not playing, Pedraza argues that it would be hard to justify his presence on the pitch in the middle of the holiday season, the busiest time of the year for the police. ‘We can’t take time off for leisure right now, but I’d give this activity a good grade.’ His answer sounds convincing. He even gave an interview to the rebel radio station after the game. Next, on a 50-50 ball, Silfredo, a robust high-ranking FARC commander playing midfield is thrown to the ground by someone from the mayor’s delegation. The public cries, ‘Uhhhhh!’ in unison at the rough tackle, and the universe seems to stop completely for a strained second. Silfredo gets up and shakes the dust off. A rough welcome to civilian life, but the game carries on. Towards the end of the second half, Mayor Velázquez, young yet corpulent, is visibly exhausted, so he calls for a sub and heads for the bench. Velázquez is a member of a controversial political party named Opción Ciudadana (Citizen Option), several members of which were ousted from Congress on charges of corruption and accusations of ties to right-wing paramilitary organisations. The mayor himself has had public brushes with the FARC, who have accused him of negligence and fraudulent conduct. I take a seat next to him and ask him why he agreed to get on the field with his enemies. ‘You know,’ he says, ‘once you step on the pitch, everybody is the same. You leave your prejudices behind and focus on scoring a goal. Sports aren’t only about health or fun; entire countries unite around their best players, and football is a great medium for reconciliation.’ The usual political spiel, but beyond the electoral interests, the fact of the matter is that this type of activity does have an integrating effect on the opposing factions and on the civilian population long caught in their crossfire. On the football field, the dynamics of war are skewed; when the ball rolls, any sworn enmity becomes inconsistent, even absurd. Why football? Because ‘the beautiful game’, as Pelé dubbed it, has a special ability to demarcate a sacred space, one that renders all other concerns irrelevant. 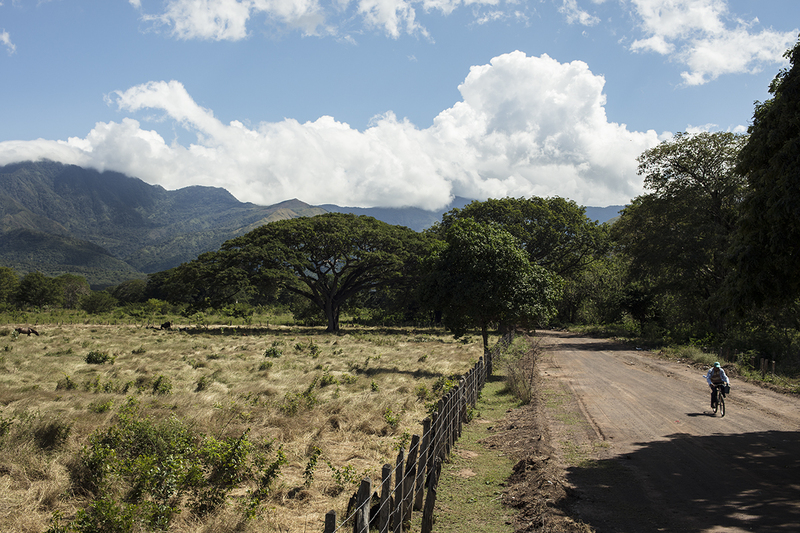 In this remote Colombian village everybody plays it and everybody loves it. Political barriers are transcended, the myths that feed antagonisms are undermined, and the other becomes humanised: a fraternising effect that doesn’t quite disappear once those magical 5,400 seconds have gone by. Game time is up, and the referee’s whistle announces the end of the match. All the players then shoot a penalty kick, and everybody cheers for each other while cracking up at a handful of outrageously bad shots. Team colours and the official score count fade away with the last orange rays of sunlight, as a festive sentiment fills the air. It is almost like that historic Christmas Eve, a century ago in France. 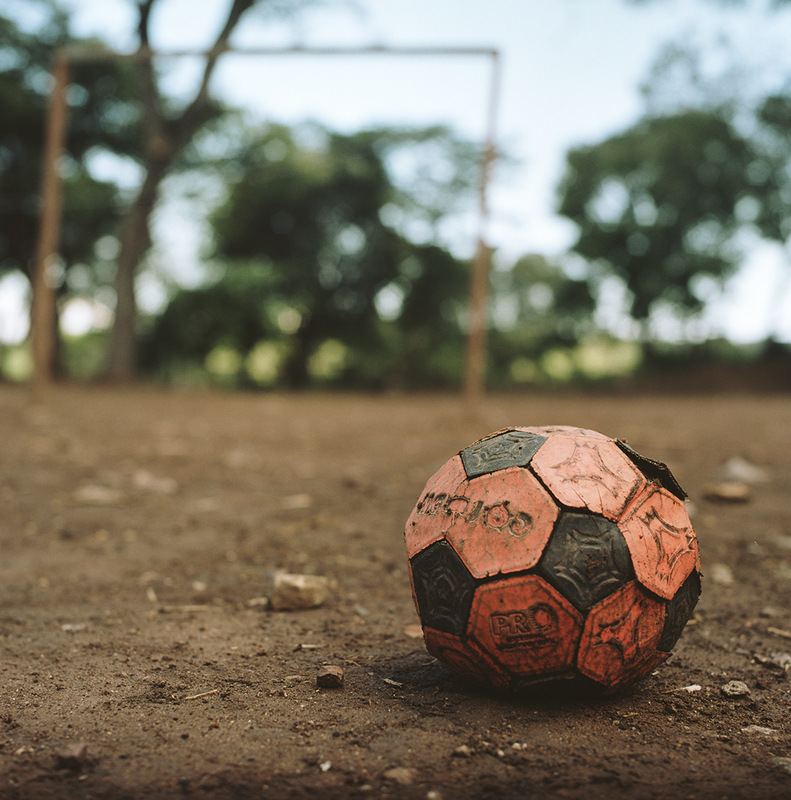 In Colombia, most massacres were committed in the football fields of dusty towns like this one, and all the fear and tragedy that this red dirt has witnessed heighten the symbolic value of the event that has just ended. Even 90 minutes of reconciliation can mark a revival in the heart of a battered society that, decade after decade, has repeatedly lost hope. Now footballs, not heads, are rolling again on the pitch. The beautiful game has done it again. Ramón Iriarte is a journalist and documentary filmmaker based in New York City and Bogotá. He’s covered social and environmental conflicts extensively throughout Latin America, and especially the war in his home country of Colombia.